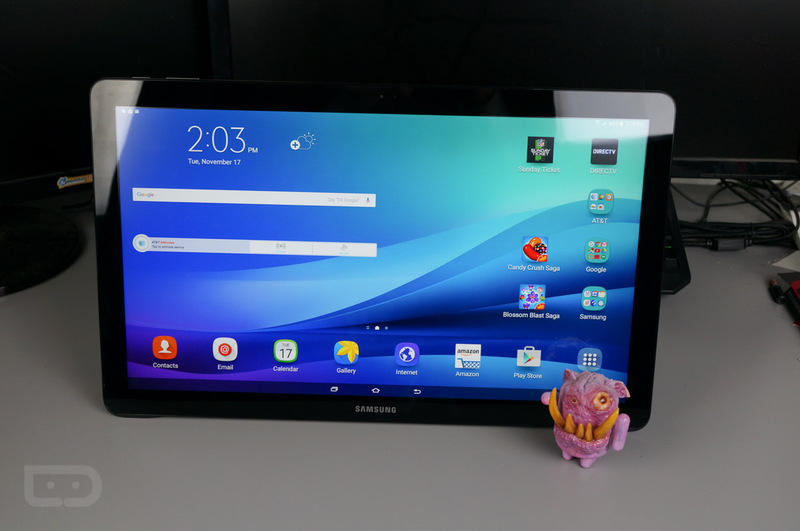 The Galaxy View tablet from Samsung, available on November 20 from AT&T, is large. There’s nothing else to say about its size. The device features an 18.4″ Full HD display, powered by a Exynos octa-core processor and 2GB of RAM. We received a unit from AT&T, preloaded with all of the DIRECTV and NFL Sunday Ticket goodies, so allow me to share my first impressions with you. Once you accept the fact that the device is ridiculously large, you begin to think about all of things you can do with a device of its size. You can consume tons of videos, mobile games, and browse the Internet on a massive touchscreen. The tablet runs TouchWiz, Samsung’s custom Android skin, on top of Android 5.1.1, which offers a few helpful software tweaks you can’t normally do on a stock Android device. For example, you can have multiple apps running at the same time, which is useful considering how much screen real estate you have access to. You can have the Chrome browser open, while also watching a movie simultaneously. On the AT&T-branded model, the carrier pushes DIRECTV quite heavily. For anyone who has DIRECTV, it may be the perfect companion device for your home, as consuming your regular TV programming, NFL Sunday Ticket, and movies is quite enjoyable on the 18.4″ display. DIRECTV access is actually built directly into the Home launcher by swiping right on the display. This brings up a quick access guide to what DIRECTV currently offers. Beyond the specialty feature of DIRECTV and NFL Sunday Ticket access, it’s basically just a large Android tablet, and we all know how useful those things are (slight hint of sarcasm). With the backside of the device featuring swiveling kickstand for use on a table or in your lap, the device is rather cumbersome and not very portable. I should also note it is rather heavy, although, not as heavy as you may expect from such a large device. Inside, the Galaxy View features just a 5,700mAh battery, which seems relatively small considering how much size they had to work with. On the exterior backside, you will find stereo speakers for loud, clear audio playback. Below, watch me go hands-on with the device, going over a few of its software features, and providing a tour of the DIRECTV and NFL Sunday Ticket apps.